As I come before you today I recognize that there is a spirit among us of support, loyalty and joy for the hometown team. And I also believe that it is the case that we have that same loyalty and support and joy for the hometown congregation—the Heartland church of Christ. And that is why you are present today. A few years ago, I presented the lesson that I am presenting today. And I was surprised that afterward a young man came to me and said, “I need to be baptized—I want to be immersed for the forgiveness of sins.” And I thought that this person was a member of the church already. And I learned a great lesson from this, that in almost every service that we will have like this, there are probably one or more people who need to be baptized into Christ for the forgiveness of sins. And so we preach on a lot of different subjects, but sometimes we assume that everybody sitting in one of the chairs has been baptized and become Christians. But that is not always the case, and therefore today I want to talk to you about the baptism of Jesus Christ. And I hope that I can make this lesson so simple that even a little child can understand it. That is my goal and that is my purpose in delivering this message. Our comments will cover the entire third chapter of the Gospel according to Matthew. Therefore you are encouraged to open up your Bibles and follow along to make sure that we faithfully present the record of the baptism of Jesus Christ. At the beginning of Matthew the third chapter, we are introduced to the cousin of Jesus Christ. You will remember that Mary went up to visit with her cousin Elizabeth. She stayed with her for most of the time that she was with child. Later on, Elizabeth who also was with child gave birth to John the Baptist. He was about six months older than Christ. We call him John the Baptist, but his name is just simply John (Luke 1:13, 60, 63). John the Baptist was a fiery preacher. He did not fit the mold of most modern preachers. He did not dress up with the fancy suit and tie and he did not live a lavish lifestyle. In the early days of our country, the preachers in the church of Christ, especially in the western part of our country, would take their rifles up into the pulpit and set them up against the wall while they preached the gospel. There was the ever present danger of being attacked by the Indians. But they did not let any danger stop them from obeying God and preaching the gospel. Some of them were what we would call as being on the rough side. But there was nothing wrong with that, and John the Baptist was somewhat like that. John dressed in camel’s hair with a leather belt around his waist. That was not a beautiful suit and tie. He did not go to the best eating places and eat the fine fare. He lived on locusts and wild honey. The Bible declares in Matthew 3:1, “In those days came John the Baptist preaching in the wilderness of Judea.” And he said to the people who flocked out to hear him, “You repent for the kingdom of heaven is at hand. For this is he who was spoken of by the prophet Isaiah, saying, the voice of one crying in the wilderness, prepare you the way of the Lord, make his paths straight” (Matthew 3:1-3). And in verse four the Bible describes the kind of garments he wore and the kind of food that he ate. “Oh generation of vipers, who has warned you to flee from the wrath to come? Bring forth therefore fruits meet for repentance: and think not to say within yourselves, we have Abraham to our father: for I say unto you that God is able of these stones to raise up children unto Abraham. And now also the ax is laid unto the root of the trees: therefore every tree which brings not forth good fruit is hewn down, and cast into the fire” (Matthew 3: 7-10). So these people who would not repent and would not confess their sins, John refused to baptize them. John declared that they were not the proper candidates for baptism because their hearts and actions were evil. “I indeed baptize you with water unto repentance: but he that cometh after me is mightier than I, who shoes I’m not worthy to bear: he shall baptize you with the Holy Spirit and with fire: whose fan is in his hand, and he will thoroughly purge his floor, and gather his wheat into the Garner; but he will burn up the chaff with unquenchable fire” (Matthew 3:11-12). John declared that someone greater than he who would come after him. He stated that this person would baptize them with the Holy Spirit and with fire. Sometimes we hear it said today that one needs to be baptized with the Holy Spirit. It is too late to be baptized with the Holy Spirit. All of the apostles and the household of Cornelius were baptized with the Holy Spirit. The Holy Spirit baptism was never promised to anyone else. No one today can be baptized in the Holy Spirit. The word “baptize” literally means to “dip, plunge, and immerse.” “Baptidzo” is the Greek word, and metaphorically or figuratively it means to be overwhelmed with something. Therefore we are too late to be overwhelmed with the Holy Spirit baptism. And we are too early to be baptized with fire. I would not think that anyone would want to be baptized with fire. That is a reference to the eternal punishment in hell at the last day. So in conclusion, Christ would baptize the apostles and the household of Cornelius with the Holy Spirit and at the last day he will baptize the disobedient with everlasting fire (2 Thessalonians 1: 7-9). Then he goes on to say, “His fan is in his hand and he will thoroughly purge his floor. And he will gather his wheat into the Garner but he will burn up the chaff with unquenchable fire.” The word “unquenchable” in the Greek is the word “asbestos.” My dad was a carpenter and I remember one time he showed me that asbestos will not burn. He took a blow torch and put it on a piece of asbestos and it would not burn. Today asbestos is a material that causes cancer and must be removed from many buildings. Therefore, the baptism of fire at the last day will be “unquenchable fire” that will never burn out—it will be everlasting. And so John the Baptist said to those people who would not repent and change their hearts that they would be burned up like worthless straw after the wheat has been removed. The word baptism is mentioned for the first time in our English New Testament in Matthew 3: 6. And we discover by reading Mark 1:4 that John the Baptist was baptizing “for the forgiveness of sins.” This baptism was for, unto or in order for the remission of sins. Now the baptism of Jesus Christ was an exception to the general rule of John’s baptism which was for the forgiveness of sins. In almost every general rule there will be an exception. There are exceptions to almost everything. And that is what gets people into trouble sometimes. They will lay down a rule and allow no exceptions. There usually is an exception to almost any rule or law. And so we are going to notice now that Jesus Christ who was baptized into John’s baptism was an exception—it was not for the forgiveness of sins. Now some of our religious friends who disagree with us about baptism for the forgiveness of sins will ask the question, “Why then was Jesus baptized?” They will ask, “Was Jesus baptized for the forgiveness of sins?” In almost every church in America one cannot become a member of it without being baptized in some way or form. I believe the Quakers are the only exception to baptism being a prerequisite for membership in a church. Some of our religious friends teach that you are baptized because your sins are already forgiven. They mean by this that you are saved before you are baptized. So when they ask, “Was Jesus baptized for the forgiveness of sins,” we can also ask them, “Was Jesus baptized because his sins were already forgiven?” A good rule works both ways. This argument is faulty because Jesus was not baptized for the forgiveness of sins and he was not baptized because his sins were already forgiven—because he had no sins to be forgiven. Now that we have that out of the way let us look at the baptism of Jesus Christ. Is baptism by sprinkling, or pouring some water over a person’s head, or by immersion? Some teachers and preachers have made the ridiculous claim that baptism is by sprinkling. This is absurd because the Greek word baptidzo and cognates means to dip, plunge, or immerse. That is what the word meant then and that is what the word means today. It is sad but true that in all the major translations of the Greek into the English, the translators will not translate that word. They are fearful of offending some religious group. If the original word had been accurately translated from the Greek into the English it would have been either “dip, plunge, or immerse.” That is the reason that people like me must preach a sermon on baptism. If there had been a proper translation there would not have been any confusion on the subject of baptism as there is today. Then all we would need to say is you must be immersed for the forgiveness of sins, and that would be the end of the matter. The truth is that the word baptism has confused so many people; we must explain it to the people according to the plain truth of the Bible. And so to be plain, the word baptism simply means dip, plunge or immerse. The writer of the book of Hebrews mentioned to his readers that their hearts had been sprinkled and their bodies had been washed with pure water. This is a reference to their bodies being washed with pure water in baptism and to their forgiveness of sins, “let us draw near with a true heart in full assurance of faith, having our hearts sprinkled from an evil conscience and our bodies washed with pure water” (Hebrews 10:22). Notice that the word sprinkled is used in that Scripture. Their hearts had been sprinkled with the blood of Christ, but their bodies had been washed with pure water—a reference to baptism for the forgiveness of sins. We know this refers to baptism because Peter declares to us that our heart or conscience is not cleansed until one is baptized: “There is also an antitype which now saves us—baptism (not the removal of the filth of the flesh, but the answer of a good conscience toward God), through the resurrection of Jesus Christ” (1 Peter 3:21). “And the priest shall take some of the log of oil, and pour it into the palm of his own left hand. Then the priest shall dip his right finger in the oil that is in his left hand, and shall sprinkle some of the oil with his finger seven times before the LORD” (Leviticus 14:15-16, Emphasis SGF). Did you catch the fact that there are three key words in that statement? Pour, dip, and sprinkle! Pour, dip and sprinkle! In their Greek translation of the Hebrew Old Testament the word pour is from (keo). Dip is from the word (baptidzo) and sprinkle is from the word (rantidzo). That is the word from which we get our English word rain—they tell us that we are going to have rain—sprinkling today. If God had wanted us to pour some water on someone’s head he would’ve used the word keo. If God had wanted a person to be sprinkled he would’ve used the word rantidzo. But he didn’t use either one of those words. The New Testament used the word baptidzo that means to dip, plunge or immerse. And the first mention in ecclesiastical history of sprinkling for baptism was in 251 A.D. That is about 150 years after the last apostle John died. As far as I know this is the first time sprinkling for baptism was ever mentioned in church history. A man by the name of Novation was baptized by pouring some water over him because he was sick. They made an exception and poured some water over him for baptism. This was called clinical baptism, but he was never allowed to be an elder or deacon in the church. This was a new practice initiated about 150 years after the close of the New Testament revelation. “I marvel that you are so soon removed from him that called you into the grace of Christ to another gospel which is not another but there be some that would pervert the gospel of Christ. But though we or an angel from heaven preach any other gospel unto you other than that which we presented unto you let him be accursed” (Galatians 1:6-9). And therefore the Council of Ravenna developed a perverted gospel, a changed gospel that was not the gospel of Christ. It took over 1200 years to develop this perverted gospel. Sometimes the word baptism can be used in a figurative sense to refer to the suffering and death of Christ and his disciples. Also it can be used to refer to the baptism of the Holy Spirit, in which the apostles were overwhelmed with the power and influence of the Spirit of God. When Jesus was ready to go to the cross, the mother of James and John came to Jesus and requested that her two boys, James and John, would have the right hand and left hand positions when Jesus would establish his kingdom. James and John were behind the request, but they sent their mother to present it to Jesus. That’s the way that boys and girls do unto this day. If they want something, instead of asking their father they will ask their mother because they believe she will be more sympathetic to what they want. And usually that is the case. Jesus said it was not for him to give this honor to them, but only to them for whom the father had reserved. Then Jesus answered them—James, John and their mother: “Are you able to be baptized with the baptism that I am going to be baptized with. Are you able to drink the cup that I am going to drink? And they said we are able.” He was asking them if they were able to be overwhelmed in the suffering, shame and death that he was going to endure on the cross. He promised that indeed they would be baptized with the baptism that he was going to be baptized with and drink the cup that he would drink. But to be on the right hand or the left hand was not his to give, but only my Father who is in heaven. And true enough, I believe that just about all of the apostles died a martyr’s death. The Fox’s Book of Martyrs gives an overview of the tradition as to how most of the apostles died in their service of the Lord. For example it is believed by many that Peter was crucified upside down on a cross because he was not worthy to be crucified like his master. But I only mention these things to point out that baptism can have also a figurative meaning as well as a literal meaning. Literally baptism means to dip, plunge or immerse, but figuratively, or metaphorically it means to be covered over or overwhelmed in something like suffering. Then Jesus came from Galilee to John at the Jordan to be baptized by him. And John tried to prevent Him, saying, “I need to be baptized by You, and are You coming to me?” But Jesus answered and said to him, “Permit it to be so now, for thus it is fitting for us to fulfill all righteousness.” Then he allowed Him. 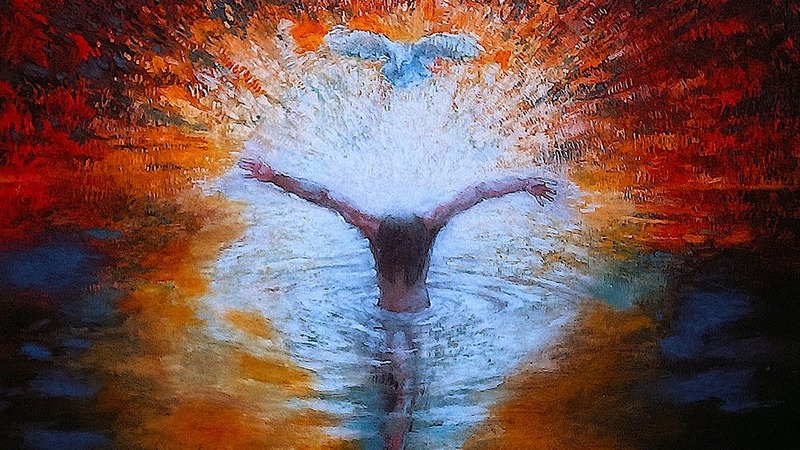 When He had been baptized, Jesus came up immediately from the water; and behold, the heavens were opened to Him, and He saw the Spirit of God descending like a dove and alighting upon Him. And suddenly a voice came from heaven, saying, “This is My beloved Son, in whom I am well pleased.” (Matthew 3:13-17, NKJV). John could not understand why he needed to baptize Jesus, but he could see why Jesus needed to baptize him. John baptized for the forgiveness of sins, but Jesus had no sins to be forgiven. That was the problem John faced. But Jesus eased his mind by asking him to make an exception in his case in order that they might fulfill all righteousness. All of God’s commands are righteousness (Psalms 119:172). Jesus wanted to leave us an example of perfect obedience to the heavenly Father and he did. Then John allowed him. I want to emphasize the statement “When he had been baptized, Jesus came up immediately from the water….” Let me ask you, “When you were baptized, did you go to the water or did they bring the water to you? Did they pour or sprinkle some water on your head or did you come up out of the water? And by a necessary inference one can not come up out of the water unless you first go down into the water—that is common sense. While his garments were dripping wet as he stood on the banks of the Jordan, the heavens were opened to Him and he saw the Spirit of God descending on him like a dove, and he heard the commending voice of his heavenly Father say, “This is my beloved Son in whom I am well pleased.” This shows us by the way that there is the Godhead. The word God is a reference to the divine nature. Some teach that there is just one person in the Godhead. According to that doctrine God sometimes appears as God the Father, at other times as Jesus Christ, and still on other occasions he may appear as the Holy Spirit. In this sense he would simply be changing his appearance as Clark Kent changed into Superman. But this is not true. There are three persons that make up the divine nature or Godhead. We call this the Trinity. This is really the only passage one needs to prove this point. When Christ was baptized he was in the body here on the earth standing on the banks of the Jordan River with water dripping from his garments. The Father was up in heaven speaking to his Son on the earth, saying, “This is my beloved son in whom I am well pleased.” And the Holy Spirit is coming down between heaven and earth in the form of a dove and lighting up on the matchless Son of God. So there we have the Father in heaven, the Spirit coming down from heaven to earth, and Jesus Christ standing on the earth. Now there are either three persons in the Godhead or Jesus Christ was the greatest ventriloquist who ever lived. And I don’t think that is the case. Now we are going to look at the question as to why Jesus Christ was baptized in the Jordan River. Why was Christ baptized by John the Baptist? The book of Luke affirms that baptism was an essential part of the Father’s will (Luke 7: 28-30). And Jesus said he came to do his Father’s will. When we pray, our prayer must be according to the will of the Father. And in the same way Jesus came to do his Father’s will. Jesus said, “For I say unto you who are born of women there is not a greater prophet than John the Baptist, but he that is least in the kingdom of heaven is greater than he” (Luke 7:28). So if you are in the kingdom of God you are greater than John the Baptist in that you have greater blessings, benefits and privileges. You also have a higher rank than did John. You are greater right now than John the Baptist. Jesus said even the least person in the kingdom of heaven is greater than John the Baptist. That should be a wonderful thought and blessing to all of us who are in Christ Jesus. “And all the people who heard him and the publicans justified God being baptized with the baptism of John” (Luke 7:29). How did they justify God—by being baptized with the baptism of John? “But the Pharisees and the lawyers rejected the Council of God against themselves being not baptized of him” (Luke 7:30). Why was Jesus baptized? He was baptized because he wanted to identify himself with those people who justified God by being baptized of John. He did not want to class himself over here with a group of people who rejected the Council of God against themselves by not being baptized with the baptism of John. So today everybody should ask themselves as to who they want to identify themselves with—those who do the will of God or those who do not do the will of God? To ask the question is to give the answer. Jesus was also baptized to receive the Holy Spirit and the approval of his heavenly Father. That is why he was baptized. It seems to me then that we also should want to be baptized in order to receive the gift of the Holy Spirit and the approbation of our heavenly Father. “I saw the Spirit come down from heaven as a dove and remain on him. I would not have known him, except that the one who sent me to baptize with water told me, ‘The man on whom you see the Spirit come down and remain is he who will baptize with the Holy Spirit.’ I have seen and I testify that this is the Son of God” (John 1:25-34). So, according to that reading Jesus was baptized in order to present himself as the Son of God to the nation of Israel. He was their Messiah. He was the Christ. He was the Savior that the prophets had spoken about from the beginning of the world. Then Jesus came from Galilee to the Jordan to be baptized by John. But John tried to deter him, saying, “I need to be baptized by you, and do you come to me?” Jesus replied, “Let it be so now; it is proper for us to do this to fulfill all righteousness.” Then John consented (Matthew 3:13-15). Therefore, from this study we have learned that Jesus was not baptized for the forgiveness of sins, because he had no sins to be forgiven. He was not baptized because his sins had already been forgiven, as some religious groups teach concerning baptism. But he was baptized to fulfill all righteousness. What does that mean? The best answer to that is found in the Psalms of David where he said, “May my tongue sing of your word, for all your commands are righteous” (Psalms 119:172, NIV). Therefore when we obey the commands of God we fulfill the righteousness of God. And our Lord was baptized to fulfill all the righteousness of God—he was perfectly obedient and righteous in the sight of his heavenly Father (Hebrews 5:8-9). Have you ever thought about what would have happened if Jesus had not been baptized by John? Then people today would say, “Well I don’t need to be baptized because Jesus was not baptized.” Therefore, we cannot even use that as an excuse for refusing to be baptized for the forgiveness of sins, because our Lord did not even need John’s baptism, he did so simply because he wanted to obey the Father’s will. Now let us give a summary of why Christ was baptized and what it teaches us today. What is the application for all of us today? If we present a lesson and we do not make an application to the here and now, what good is it? Therefore we must make an application to all of us today. 1. Jesus traveled about 60 to75 miles in order to be baptized. Therefore the argument that is sometimes made to sprinkle some water on someone for convenience is not valid. If that is the action of baptism it could have been done at Nazareth instead of coming all the way to the Jordan River. In baptism you do not bring the water to the person, but you bring the person to the water. Jesus went to the water in order to be baptized. Jesus went to the water instead of the water being brought to him. This is what happens when a person is immersed, but it does not happen when a person is sprinkled for baptism. 2. Jesus went to much water in order to be baptized. He did not go to a pitcher of water, but he went to the Jordan River. “Now John also was baptizing at Aenon near Salim, because there was plenty of water, and people were constantly coming to be baptized” (John 3:23). Bible baptism requires plenty of water, but sprinkling for baptism does not require much water. My mother was born and reared near Monticello, Kentucky—a beautiful area of our country. 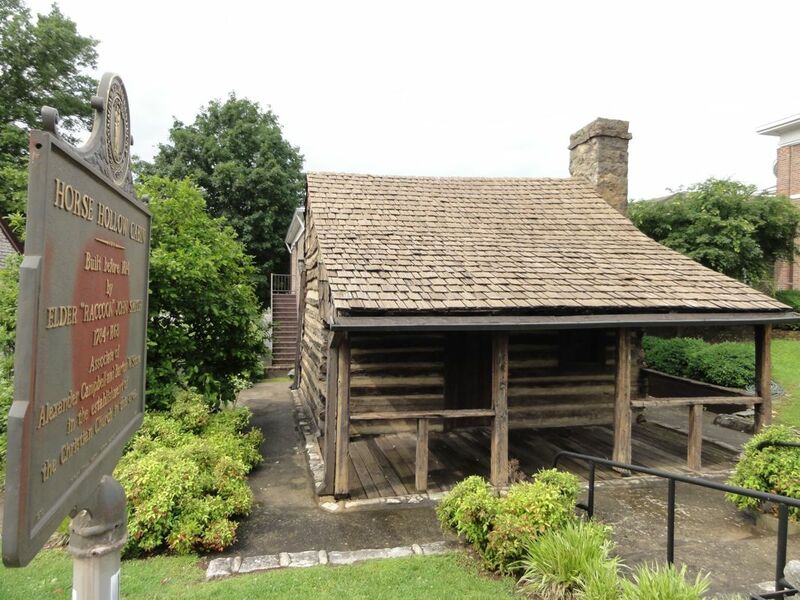 In the middle of town there is a *cabin that has been erected as a memorial to Raccoon John Smith—one of the pioneer preachers of the restoration movement. 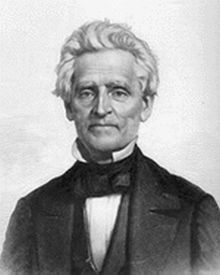 He was a pioneer preacher much like John the Baptist in dress and speech. He probably wore a raccoon cap or something like that. The story is told that one time there was to be a baptism that involved sprinkling the candidate with some water. 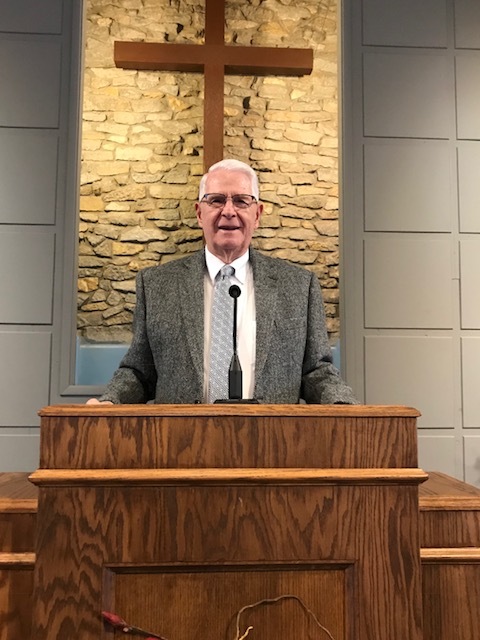 The preacher had a pitcher of water and while he was getting ready to baptize the candidate, **Raccoon John Smith slipped up behind him, picked up the pitcher of water, poured some of the water upon the ground and then drank the rest of it. When the preacher was ready to sprinkle some water he noticed the pitcher was empty. It was at this point that Raccoon John Smith said to the preacher, “I am sorry but I just drank your Jordan dry.” And so Jesus was baptized where there was much water. One cannot be baptized in a scriptural way with a pitcher of water. 3. Jesus went down into the water because the Bible says he came up out of the water. This is a description of baptism by immersion but not by sprinkling or pouring some water upon the head of the candidate. What shall we say then? Shall we continue in sin that grace may abound? Certainly not! How shall we who died to sin live any longer in it? Or do you not know that as many of us as were baptized into Christ Jesus were baptized into His death? Therefore we were buried with Him through baptism into death, that just as Christ was raised from the dead by the glory of the Father, even so we also should walk in newness of life (Romans 6:1-4, NKJV). According to this passage of Scripture we are baptized into Christ—into a relationship with Jesus Christ. Also the action of baptism is pictured as a burial into the death of Christ—we are buried with him through baptism into death and then raised just as Christ was resurrected from the dead. And the implication from all of this is that we are to walk in newness of life. We are to live a different kind of life than we lived before we were baptized. Our Christian life is to be one that honors God and is faithful to Christ. We have another passage that is also strong in indicating the action and purpose of baptism. To the church at Colossae Paul declared, “Buried with Him in baptism, in which you also were raised with Him through faith in the working of God, who raised Him from the dead. And you, being dead in your trespasses and the uncircumcision of your flesh, He has made alive together with Him, having forgiven you all trespasses (Colossians 2:12-13, NKJV). There is no efficacy in the water. Just going down into the water and coming up out of the water is not what saves us from our sins. We are forgiven of all our trespasses through our faith in the operation or the working of God. The blood of Christ is applied to our sins when we obey the Lord in baptism and receive the promise of forgiveness. We are buried with him in baptism and then raised with him through our faith in the working of God. So it is the power of God that saves us just as it was the power of God that raised Jesus from the dead. And we were dead ourselves in our trespasses and sins, but we have been made alive together with Christ through our faith and obedience in the working of God. This demonstrates that the faith that saves is the faith that obeys. “For you are all sons of God through faith in Christ Jesus. For as many of you as were baptized into Christ have put on Christ. There is neither Jew nor Greek, there is neither slave nor free, there is neither male nor female; for you are all one in Christ Jesus. And if you are Christ’s, then you are Abraham’s seed, and heirs according to the promise” (Galatians 3:26-29, NKJV).